In 2016 there were 3,591 marital breakdowns in the Basque Country, an increase of 1.6% compared to the previous year, according to Eustat data. Of the total number of breakdowns, 16.5% were processed by the courts in Álava, 54.3% in Bizkaia and 29.3% in Gipuzkoa. Marital breakdown is defined as the dissolution of a marriage due to direct annulment, separation or divorce. In other words, marriages that have ended without a prior legal separation. Of the total number of direct divorces, 2,636 were dissolved by mutual consent and 800 were contested, an increase of 4.9% and a decrease of 7.4%, respectively, compared to the previous year. As for separations, 117 were dissolved by mutual consent and 38 were contested. In 61.5% of marital breakdowns the request was filed jointly by both spouses, in 24.5% by the wife and 12.7% by the husband. 38.2% of break ups occurred before the tenth anniversary of the marriage and 26.1% after 20 years. 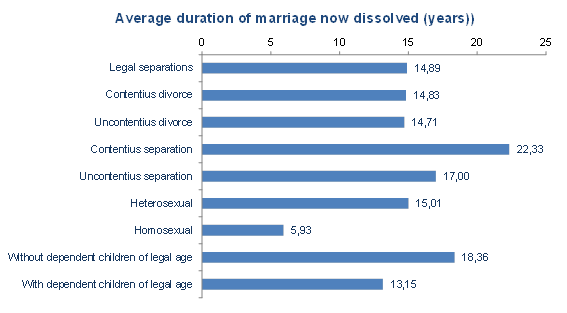 In the case of separations, 54.8% of marriages lasted 15 years or more. The marriages dissolved directly through divorce lasted on average 15 years, a figure that rose to 18 years among those dissolved with a prior legal separation. 30.3% of dissolved marriages had no minor children or dependants of legal age; 60.9% had only minors, 3.2% had only offspring of legal age who were economically dependent and in 5.6% of cases there were both minor and legal age dependants. In 59.8% of marriages with children, child support was paid by the father, in 8.0% by the mother and in 32.2% by both spouses. Regarding the custody of minor children, in 57.0% of cases it was granted to the mother, in 8% to the father, and it was shared in 34.7% of cases. Regarding divorces, in 2016 there was a total of 3,895, divided into 459 cases where there had been a prior legal separation and 3,436 direct divorces. 3,844 heterosexual couples got divorced as well as 51 homosexual couples, 37 of them male and 14 female. In reference to heterosexual divorces, the majority took place in the 40-49 age range, in the case of both men and women, comprising 41.0% and 41.9%, respectively, of the total of divorcees. The average age of women at the time of divorce was 44, whilst for men it was 47. Regarding the nationality of spouses, 9.4% of men were foreign, and the percentage of foreign wives was similar, at 9.6%. As for the civil status of the spouses when they entered into the now-dissolved marriage, 85.7% of men were single, a figure which stood at 90.4% in the case of women. Most spouses were resident in the Basque Country on the date of the divorce, although 3.1% of men and 5.7% of women resided outside the Basque Country. Of the 155 separations that occurred in 2016, just 1 more than in the previous year, 75.5% were by mutual consent and 24.5% were resolved through legal action. Heterosexual couples accounted for 154 separations and 1 separation corresponded to a homosexual couple. In separations of heterosexual couples, the average age of women was 46 and the average age of men was 49.